Growing planter trees is a simple and easy way to add natural beauty as well as a sense of serenity and luxury to indoor and outdoor spaces. 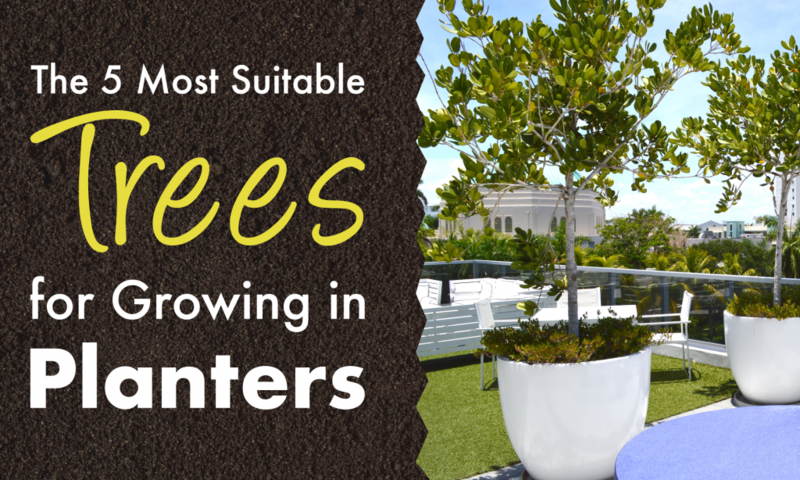 Unlike full-size landscape trees and shrubs, which need plenty of space to grow, planter trees don’t need too much space. Therefore, trees grown in pots are perfect for small gardens, patios, terraces and other areas where space is limited. When selecting a tree to grow in a container, it’s important to consider the same factors as you would for any other plant, namely the local climate, light exposure, the type of soil and the type of planter required. Since not all trees are suitable for growing in planters, here are our top 5 picks for the best trees that can thrive in pots. …of all kinds, but most commonly oranges, tangerines, lemons and limes. These trees can grow vigorously in large containers and make pretty accents especially during bloom and fruit development stages. All citrus trees love sun and heat, so they’re excellent choices for warmer climates. Japanese Maple, also called Acer Palmatum, is a lovely container plant. Although all Japanese Maples have delicate foliage, which shimmers when placed in bright spots, Orangeola and Crimson Queen varieties are the only ones with spectacular fall foliage. Japanese Maples are some of the best planter trees not only because they’re beautiful but also because they have small roots and a slow growth rate. Consider using a planter like that of the Rio Grande or the Salzburg planter. In warmer climates, Japanese Maples grow best in sheltered areas that provide protection from intense sunlight and wind. In general, this tree can grow up to 25 feet tall, but dwarf varieties are also available. However, most Japanese Maples need repotting into bigger containers every couple of years. Additionally, regular pruning is required to maintain the tree small and bushy. Southern Magnolia makes a tidy accent tree, which thrives in partial shade or locations that receive abundant sunshine. The beauty of this tree consists in the richness of its foliage throughout the year and the arrangement of its two-sided leaves, which make an excellent contrast: the upper surface of the leaf is deep, glossy green, while the underneath is velvety bronze. This tree is also renowned for the mesmerizing scent of its blooms. Fully matured, landscape trees can grow up to 90 feet tall. However, the height and width of a potted Southern Magnolia can be easily controlled through frequent clipping. The Wannasee planter would compliment this magnolia no matter if you grew it in its entirety or kept it small. Dwarf Edible Fig varieties grow well in containers, like that of the Niagara container, as long as they have enough water and get about 8 hours of full sun per day. These trees have large canopies, with bright-green lobed leaves that cast deep shade and remain attractive year-round. Although most Edible Figs are prolific in fruit production, look for a variety marked “self-fertile” to make sure that your tree will produce fruit. At maturity, Edible Figs can reach up to 30 feet tall, but they can be kept small with adequate pruning. Growing an Olive tree in a planter is a great idea because this plant is particularly tolerant of dry air, meaning it thrives indoors as well as outdoors during warmer weather. Furthermore, the Olive tree is naturally shallow-rooting, so most varieties live happily in containers for many years, especially when given proper care. In this case, proper care means an adequately sized planter, consistent moisture, well-draining soil and a sunny location with at least 7 hours of full sun per day. Similar to other planter trees, Olive trees can be kept smaller with timed pruning. As planter trees remain in potted environments, it’s best to opt for small varieties or for large, vigorous species that can tolerate hard pruning. As well, it’s very important to follow proper watering, fertilizing, pruning and repotting practices, specific for the trees you grow in planters. Don't miss out on our latest product information.